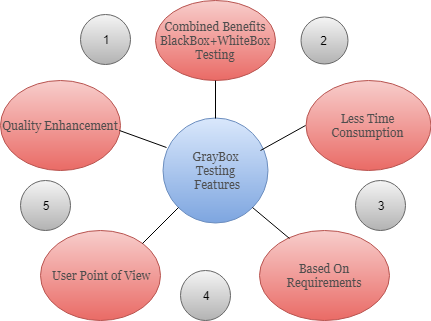 Greybox testing is a software testing method to test the software application with partial knowledge of the internal working structure. It is a combination of black box and white box testing because it involves access to internal coding to design test cases as white box testing and testing practices are done at functionality level as black box testing. GreyBox testing commonly identifies context-specific errors that belong to web systems. For example; while testing, if tester encounters any defect then he makes changes in code to resolve the defect and then test it again in real time. It concentrates on all the layers of any complex software system to increase testing coverage. It gives the ability to test both presentation layer as well as internal coding structure. It is primarily used in integration testing and penetration testing. It provides combined benefits of both Blackbox testing and WhiteBox testing. It includes the input values of both developers and testers at the same time to improve the overall quality of the product. It reduces time consumption of long process of functional and non-functional testing. It gives sufficient time to the developer to fix the product defects. It includes user point of view rather than designer or tester point of view. It involves examination of requirements and determination of specifications by user point of view deeply. Grey box testing does not make necessary that the tester must design test cases from source code. To perform this testing test cases can be designed on the base of, knowledge of architectures, algorithm, internal states or other high -level descriptions of the program behavior. It uses all the straightforward techniques of black box testing for function testing. The test case generation is based on requirements and preset all the conditions before testing the program by assertion method. First, select and identify inputs from BlackBox and WhiteBox testing inputs. Second, Identify expected outputs from these selected inputs. Third, identify all the major paths to traverse through during the testing period. The fourth task is to identify sub-functions which are the part of main functions to perform deep level testing. The fifth task is to identify inputs for subfunctions. The sixth task is to identify expected outputs for subfunctions. The seventh task includes executing a test case for Subfunctions. The eighth task includes verification of the correctness of result. The test cases designed for Greybox testing includes Security related, Browser related, GUI related, Operational system related and Database related testing. This testing technique comes under Grey Box testing. It defines all the used variables of a particular program. In any program, variable are the elements through which values can travel inside the program. It should be as per requirement otherwise, it will reduce the readability of the program and speed of the software. Matrix technique is a method to remove unused and uninitialized variables by identifying used variables from the program. Regression testing is used to verify that modification in any part of software has not caused any adverse or unintended side effect in any other part of the software. During confirmation testing, any defect got fixed, and that part of software started working as intended, but there might be a possibility that fixed defect may have introduced a different defect somewhere else in the software. So, regression testing takes care of these type of defects by testing strategies like retest risky use cases, retest within a firewall, retest all, etc. The purpose of this testing is to cover maximum code with minimum test cases. Test cases are designed in a way that can cover maximum code as well as GUI functions with a smaller number of test cases. Pattern testing is applicable to such type of software that is developed by following the same pattern of previous software. In these type of software possibility to occur the same type of defects. Pattern testing determines reasons of the failure so they can be fixed in the next software. Usually, automated software testing tools are used in Greybox methodology to conduct the test process. Stubs and module drivers provided to a tester to relieve from manually code generation.